220 records – page 1 of 5. Photographic postcard of an unidentified family of four on the lawn in front of a house. The woman is wearing a late Victorian style dress with lace trimming at the neck and a brooch. She is sitting on a wicker chair, and the man is in a shirt with a collar, and a polka dot vest. He is sitting on the armrest of the chair. In front of them are two babies sitting on the lawn, both in white dresses. 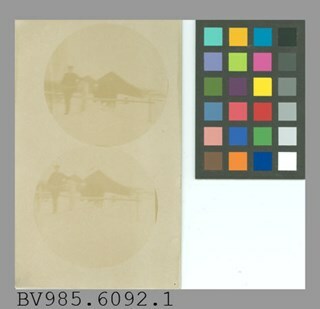 Photograph is a studio portrait of an unidentified young woman taken in a photographic studio. She is in a long light coloured pleated dress, and is standing behind a chair. She has her elbows resting on the back of the chair, and leans her face onto her hands. Photograph of Catherine Mary Corner (later becoming Mrs. Levins), as a baby. She is wearing a white smock, socks and strapped shoes. Her mother was Edna Bateman Corner, eldest daughter of Edwin W. Bateman, the builder of the Elworth house at the Burnaby Village Museum. Notes on verso of postcard read: "18 months" and "Cartherine M. Corner"
Photographic postcard of grade eight girls from Burnaby South High School sitting and standing in three rows in front of the school building. Sitting in the front row (from left) are; Sandra MacCarthy, Beatrice Dione, Gladys Richardson, Eunice Forster, Thelma Butler, Janice James, Edith Bryson and Doris Peardon. Standing in the middle row are; Joan Ambridge, Rita Tory, Daphne Bradshaw, Jeanette Cruikshank, Bernice Kirk, Hannah Frith, Lorraine (last name unknown), Dorothy (last name unknown) and Betty Flatt. Standing in the back row are; Sheila Martin, Marion Mortimer, Ella Beatty, Marie Dean, Joanetta Messinger, Frances Spackman, Gloria Arnold, Rosanne Fraser, Flora Lawrie and Joan (last name unknown). Note in black ink on verso of photograph reads: "Grade 8 / Front Row Sandra McCarthy, Beatrice Dione, Gladys Richardson, Eunice Forester, Thelma Butler, Janice James, Edith Bryson, Doris Peardon Middle Row- Joan Ambridge, Rita Tory, Daphne Bradshaw Janette [sic] Cruikshank, Bernice Kirk, Hannah Frith Lorraine [illegible], Dorothy [illegible], Betty Flatt Back Row - Sheila Martin, Marion Mortimer, Ella Beatty Marie Dean, Joanetta Messinger, Frances Spackman, Gloria Arnold, Rosanne Fraser, Flora Lawrie, Joan [illegilbe]"
Photographic postcard of grade nine students from Burnaby South High School sitting and standing in three rows in front of the school building. Sitting in the front row (from left) are; Peter Adams, LeRoy Shaver, Harold Swan, Bob Schmid and Desmond Mayne. Sitting in the second row are; Jeanette Cruickshank, Thelma Butler, Janice James, Edith Bryson, Hannah Frith, Kay Graves, Eunice Forster, Rita Tory, Betty McLachlan and Sandra MacCarthy. Standing in the third row are; Elsie Williamson, Stella Maruk, Aleda Wadham, Gladys Judge, Marion Mortimer, Lois Winters, Joan Adlem, Doris Peardon, Eleanor Thomson and Ella Beatty. Standing in the back row are; Dale Bonnycastle, Pat (last name unknown), Betty Robertson, Dorothy Kool, Frances Spackman, Helen Obrastroff, Flora Lawrie, Mary Lou Neeley, Gloria Arnold, Rodney Cairns and George Vipond. 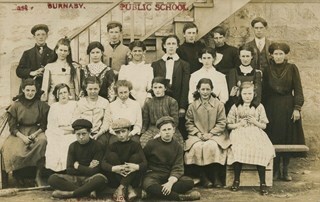 Photograph of students in Class Nine at Burnaby South High School sitting and standing in four rows in front of the school building. Sitting in the front row (from left) are; Marvin Soll, Bob Schmid, Sam Badger (holding up a sign that says, 'BURNABY SOUTH/ HIGH SCHOOL/ 1943 CLASS 9 1944"), Desmond Mayne and Le Roy Shaver. Sitting in the second row are; Lois Winters, Sandra MacCarthy, Thelma Butler, Nancy Turnbull, Elleanor Thompson, Elsie Williamson, Betty McLaughlan, Eunice Forster, Beatrice Dione and Gloria Arnold. Standing in the third row are; Doris Peardon, Rosanne Fraser, Leona Milne, Betty Robertson, Frances Spackman, Helen Obrastroff, Hannah Frith, Aleda Wadham, Ella Beatty and Joan Adlem. Standing in the back row are; Gordon Love, Victor McPherson, Jim Middleton, Rodney Cairns, Dave Gray, Peter Adams, Jimmy MacArthur, Harold Swan and George Vipond. 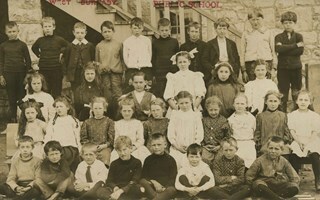 Note in black ink on verso of photograph reads: "Front Row. L-R - Marvin Soll, Bob Schmid, Sam Badger, Desmond Mayne, Le Roy Shaver./ 2nd row. 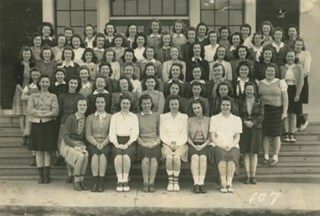 Lois Winters, Sandra McCarthy, Thelma Butler, Nancy Turnbull, Elleanor Thompson, Elsie Williamson, Betty McLaughlin [sic], Eunice Forster, Beatrice Dione, Gloria Arnold/ 3rd Row. Doris Peardon, Rosanne Fraser, Leona Milne, Betty Robertson Frances Spackman, Helen Obrastroff, Hannah Frith, Aleda Wadham, Ella Beatty, Joan Adlem./ Back Row Gordon Love, Victor McPherson, Jim Middleton, Rodney Cairns, Dave Gray, Peter Adams, Jimmy MacArthur, Harold Swan, George Vipond"
Photographic postcard of a woman seated beside a side table, and holding a baby sitting on a cushion on the side table. The woman is in a white high neck blouse wih long dark skirt. The baby is wearing a lace trimmed skirt and dark coloured shoes. An annotation on the back of the photograph reads: "Margaret Mary Hulme, age 5 months / photo taken December 14th 1911 / With all Best Wishes for 1912." Printed on the back of the postcard paper: "C. F. Wiggins, 63 Talbot Rd., Blackpool." Photographic postcard of three unidentified women taken in a photographic studio. The older woman is sitting on a chair in the front, and is wearing light coloured top with beads around her neck, and a long dark skirt that goes down past her calves. The two younger women who appear to be the older woman's daughters are in knee length dresses of polka dot patterns and mary jane shoes and are standing by the woman. Printed on the back of the postcard paper: "Gale's Studios, / Branches in all Towns." Stamped on the back of the photograph: "Oct 1929 [or 1925]." Photographic postcard of two unidentified young women wearing white dresses taken in a photographic studio. One of the girls is wearing a large hat and is standing beside the other girl who is seated on a chair. She is holding a small thin book in one hand and the other hand is rested on a table. Photographic postcard of Sophie A. Long writing a letter at a table. There is drapery in the back and velvet covered upholstery in the background. Written on the back of the postcard: "For Reg & [Lolo? ], with much love from their aged Mother Sophie A. Long / July 21st. 1918. / Rock Mount: / Miss Rolls made me a present of these before I left [Caterhaur?]. Taken without my knowing at the moment. / Germans retreating across the Marne [in northeast France] today. We had a nice hot dinner 7.30 PM. It was cooked in the Hay box." Photographic postcard of a class of young women at Burnaby South High School posed outside of the building. The Old Age Pensions Department, W.C.B. St. Louis Car Co. St. Louis, Mo. Bought from E-Bay as purchase #1093584940. Postcard, vertical, rounded corners; coloured illustration by C.W. Simpson, of young boy in chaps and red shirt on bucking brown horse; in white at bottom left, "BRONCO RIDING WESTERN CANADA. 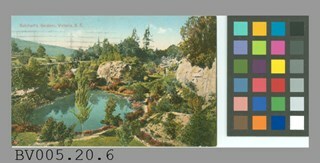 "; 1906; on reverse in brown, "SOUVENIR POST CARD"; up left side, "The Valentine & Sons' Publishing Co. Ltd.. Montreal and Toronto" "Printed in Great Britain"; three dotted lines for address at right, at bottom "Valentine's Series of Western Canada from Paintings"; addressed in pencil to "Mrs. Douglas MacKay" "Russell Man. "; "Jan. 22.09. Dear Sister Sorry to hear D. was sick. I expected a letter today but did not get any. Ben is up here now, he came on the 20th. everything is OK." "R. Patterson"; green Edward VII stamp at upper right, "CANADA POSTAGE" "ONE CENT" "1", cancelled by diagonal bars, in round shape; postmarked "TUXFORD" "JAN 23 09"; soiled, stained, spotted, creased; corners are worn; red marks; brown residue, from scrapbook page? 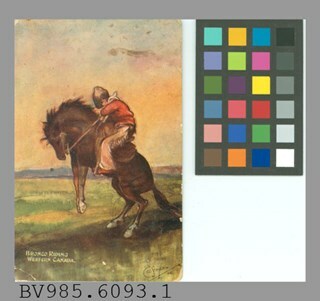 Bronco Riding Western Canada Mrs. Douglas MacKay C.W. 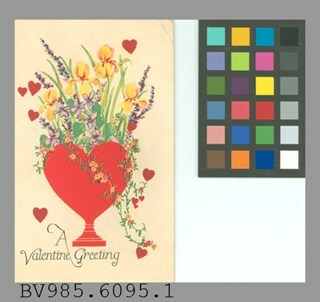 Simpson The Valentine & Sons Publishing Co. Ltd.
A Valentine Greeting Miss Gertrude Enderby, B.C. Capitol Hill P.O. was Harry's store. This item was given to the donor when he was doing research for the Cemetery Tour, 2005. Photographic postcard of an unidentified young woman with short dark hair taken in a photographic studio. She is wearing a dress with vertical stripes, and has a pendant around her neck. There appears to be a faint outline of a face depicted in the pendant. 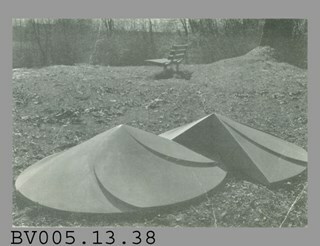 An annotation on the back of the photograph reads: "2/23." Photographic postcard of men and women standing by the railway tracks. 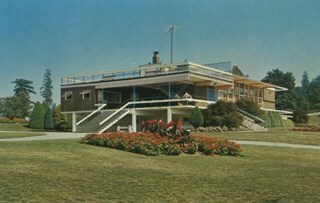 There is a couple standing together on the left of the photograph, who have been identified as Dave and Birdie. Dave is holding an umbrella in one hand, and holding Birdie's hands with the other hand. The other three people are standing on the right side of the photograph and two of them have been identified as F. Graham, and Jack. A tall woman standing on the extreme right of the photograph has been unidentified. Annotations on the front of the photograph read: "Dave / Birdie / F. Graham / Jack / ?" Photographic postcard of a man in a priest's clerical clothing with a white collar. The annotation on the back of the photograph reads: "this Mr. Davies / Curate of St Georges Church." Printed on the back of the postcard: "Published by F. Campbell. Bolton." and "Affix Halfpenny Stamp." Photographic postcard of a man in a priest's clerical clothing with a white collar. 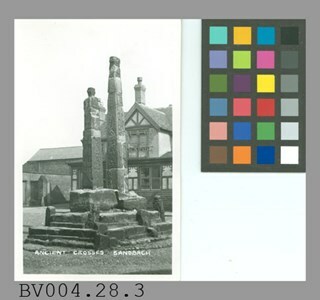 Annotation on verso of the postcard reads: "this is Mr. Elsie vicar of St Georges church." Printed on the verso of the postcard: "Published by F. Campbell. Bolton." and "Affix Halfpenny Stamp." Power Dam, Powell River B.C. Image from personal photograph album of Tom Irvine (Tommy Irvine). 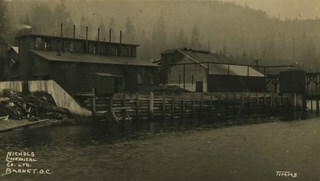 Photographic postcard of the Power Dam at Powell River. Photographic postcard of the Power Dam at Powell River. Photographic postcard of Nichols Chemical Company on Barnet Road, Barnet, with buildings at the edge of the water. Annotation at bottom of photograph reads, "Nichols Chemical Co. Ltd., Barnet, BC / Timms"
Photographic postcard of pink rhododendron blossoms. 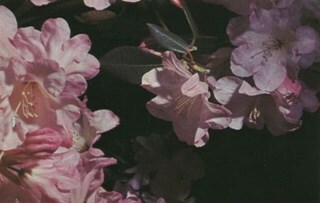 The caption on the back of the photograph reads: "The official flower of Burnaby BC. This beautiful plant is given a place of honour in public parks and home gardens. The Burnaby Rhododendron and Spring Flower Show is held annually in May and prizes are awarded for displays." 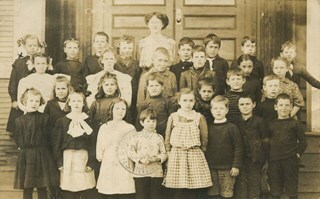 Photographic postcard of a teacher with a class of twenty-eight students, standing on the steps of an unknown school. All in the photograph are unidentified. 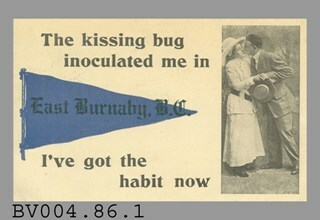 The postcard has been used and is addressed to a "Miss Alice Holland, Timberland, Yale Road" and is postmaked "Vancouver, May 22, 1909." The note written on the postcard reads: "Dear Alice, You will be surprised to get this card but I hope you will like it. Your papa will show you which is me. This is my room at the school. Do you go to school yet? Your papa will see on the card who took these. The little girl where the cross is, is the one that saved me from drowning last summer. I am partial to her. Come and see me soon. From your friend, Olive." 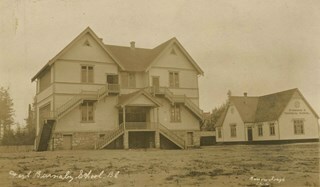 Photographic postcard of the Gilmore Avenue School building with a few children standing on the front step (all unidentified). 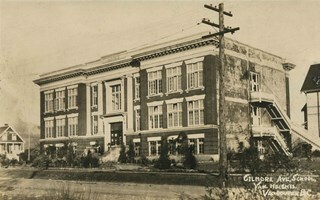 Written on the bottom right of the postcard is; "Gilmore Avenue School, Vancouver Heights, Vancouver BC." At the bottom left, the photographer is identified as J.M. Henton, Vancouver.